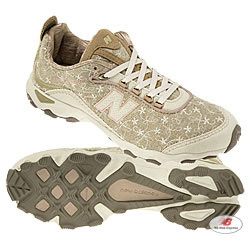 New styles of the New Balance 790's are here on NB Web Express! Check out the new kid's styles , men's styles and women's casual styles. They are so lightweight and come in so many colors, they have become pretty popular. But the 790's are more than just a great fashion shoe; the rugged outsole and lightweight feel make them a great pick for light trail running. So, if you're off for a quick, low impact run, the 790's could be the shoe for you. With the heat turning up, who wouldn't need something light and airy for the great outdoors?